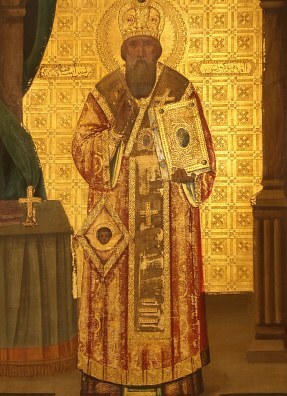 St. Cyril was the hero of strong authentic faith. Enthroned patriarch of Alexandria in 412, he defended the title of the Virgin Mary "Mother of God" (THEOTOKOS) against the aberration of Nestorios, patriarch of Constantinople at that time. He presided over the third ecumenical council held in Ephesia in 431 in the name of the pope of Rome where he imposed himself through his world and knowledge. He died in 444 leaving a rich heritage of important numerous writings explaining the Holy Book and various religious issues. يا دليل الايمان القويم و معلم التقوى و السيرة الحميدة، كوكب المسكونة و زينة رؤساء الكهنة، كيرلس الحكيم ملهم الله. لقد أنرت الجميع بتعاليمك، يا قيثارة الروح. فاشفع الى المسيح الاله فى خلاص نفوسنا.